The distinctive sweet-tart flavor and enticing aroma of American grown raspberries are the perfect complement for fruity Thai, and tart and tangy Chinese hibiscus in this robust herbal blend. Soothing when served warm, this blend is also satisfying and refreshing when served as iced tea. 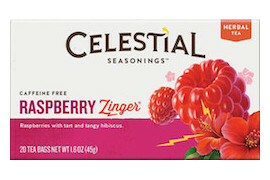 Ingredients: Hibiscus, rosehips, roasted chicory root, blackberry leaves, orange peel, natural raspberry flavor with other natural flavors, lemon grass, raspberries, raspberry leaves, and citric acid. Contains soy lecithin.